In a post earlier this month, I referred to Obama as “the most divisive, hyper-partisan president since Nixon.” I was prepared for push-back from Democrats contending that the second George Bush was more divisive. The Iraq War certainly became divisive over time, but it started with broad bipartisan support. Of Obama’s biggest initiatives, Obamacare passed without a single Republican vote, and “Porkulus” had only a handful. Now the nice folks at Gallup have provided polling data documenting just how divisive Obama has been (hat tip: Peter Wehner). Gallup headlines its article “Obama’s Fourth Year in Office Ties as Most Polarized Ever,” but to me, the most interesting data is in the chart reproduced above, showing the gap between Republican and Democratic approval rates averaged across the presidents’ entire incumbency. Obama’s average gap thus far is 70 points, on pace to shatter G.W.Bush’s prior record of 61 points. (Hm… 70 breaks a prior record of 61… where have I heard those numbers before?) Interestingly, Nixon, who stands out in my mind as a divisive leader, came in only fifth in Gallup’s rankings. The trend toward increasingly partisan evaluations of presidents over time is also evident in the fact that no president before Ronald Reagan had more than a 41-point party gap in approval ratings, but four of the last five presidents (the exception is George H.W. Bush) have had better-than 50-point divisions in approval ratings by party. So should we let Obama off the hook because of the historical accident of our highly partisan times? Naw. In 2008, Obama held himself up as a post-partisan beacon. But from the very beginning of his presidency, he has seemed intent on creating friction rather than reducing it. On his third day in office, he froze Republicans out of the Porkulus negotiations by telling them pointedly, “I won.” He went on to champion a healthcare package that was rammed through Congress in strict party-line votes — including votes scheduled for the middle of the night in the rush to pass the bill before people realized what was in it. The fruits of Obama’s antagonism will be harvested soon. With the debt ceiling kicked down the road again, the stage is set, as Newt Gingrich described, for battles over the sequester and the continuing resolution. The sequester’s draconian automatic spending cuts take effect March 1 unless Congress votes otherwise, and I expect House Republicans will be virtually unanimous in letting the cuts occur, unless they can win cuts of comparable size elsewhere from the Democrats. 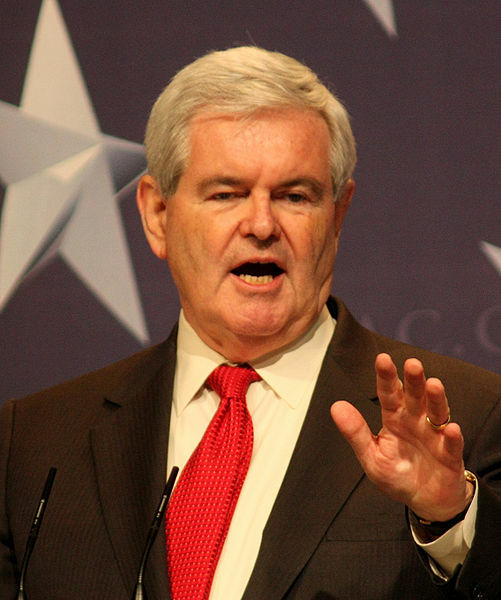 I’m not a fan of Newt Gingrich, but despite his unappealing attributes, he is an intelligent and thoughtful man who understands how Washington works, and who sometimes has ideas worth hearing. He believes strongly that the debt ceiling is the wrong fight for the GOP to use what little leverage it has to force spending cuts. On reflection, I think he’s right. The debt ceiling would be a much better battleground than the so-called “fiscal cliff,” but Gingrich argues persuasively that two other looming deadlines offer better options. He suggested that the time for Congress to draw the line on spending is before they “rack up the bills” — to paraphrase the president. We have two immediate opportunities to heed the president’s words: the Sequester bill that is coming up in 60 days and the Continuing Resolution at the end of March. There is an enormous difference between the Continuing Resolution, the Sequester bill and the debt ceiling. The debt ceiling involves the faith and credit of the United States. It can not be held hostage because the crisis impact of failing to pay the government’s debts would be immediate, worldwide, and shattering. Every element of the business community and the news media will spend the next two months beating up Republicans if the debt ceiling is the focus of the conflict. This past weekend’s media focus is just a taste of what is coming. If Republicans fall for the debt ceiling trap they will once again be isolated in a corner, identified as negative extremists, and ultimately forced to back down with maximum internal conflict and bitterness among conservatives and Republicans. Will the House GOP heed the words of the former Speaker? Some of them certainly will vote against allowing the country to go further into debt. But for the reasons Gingrich states, I expect enough of them will step back from the brink (or they will “cave in,” if you prefer that metaphor) to pass a debt limit increase. If Republicans stick to their guns, come February, Obama will agree to deep spending cuts in exchange for a debt-limit increase. There is a reason why every significant debt-reduction bill in the past 27 years — starting with the Gramm-Rudman-Hollings Act in 1985 — was linked to a debt-limit increase: It’s the only thing that forces Washington to enact spending cuts. With a president in office who believes “we don’t have a spending problem,” it’s the only thing that can force them today. If the magic-coin episode [the silly idea to mint a trillion-dollar coin – KP] teaches Republicans anything, it’s that Democrats know the president is cornered. So if Republicans blow this opportunity — if they buy Obama’s bluff and capitulate as they did on the fiscal cliff — they’ll need more than a magic coin to save their political hides. Republicans in Congress have two choices here: They can act responsibly, and pay America’s bills; or they can act irresponsibly, and put America through another economic crisis. But they will not collect a ransom in exchange for not crashing the American economy. The financial well-being of the American people is not leverage to be used. The full faith and credit of the United States of America is not a bargaining chip. And they better choose quickly, because time is running short. Obama got away with ramming Obamacare down an unwilling America’s throat without a single Republican vote, while employing every legislative trick in the book in a race against time. He paid for that by losing the House in the 2010 election, but won reelection for himself in 2012 — in part because Romneycare made his opponent uniquely unsuited to capitalize on the president’s Obamacare vulnerability. 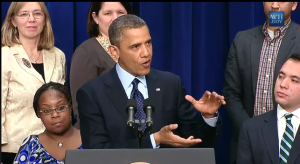 Obama doesn’t know how to cooperate with Republicans, he only knows how to demonize them. So far that’s been working for him. Republicans need to choose their battles carefully. Is a Debt Ceiling Showdown Worth the Risk? A think tank called the Bipartisan Policy Center has been updating a thorough and dispassionate consideration of what exactly will happen if there is no deal to raise the debt ceiling. The Center’s 48-page slide deck predicts that absent a debt ceiling increase the “X Date” — the first day that the Treasury will no longer have sufficient funds and daily income to pay all of its bills on time — will arrive between February 15 and March 1. That’s five to seven weeks from now. The potential consequences are scary stuff. It’s never happened before, so there is no template. The Treasury has two basic alternatives: 1) prioritize some payments and refrain from paying others; or 2) pay each day’s bills in full only after enough tax revenue has been collected to cover all of them. By then, of course, the next day’s payments will already be late. Regardless of what the Treasury does, it will at least arguably be breaking the law. If it elects to pay certain bills in full and delay others, it will be picking winners and losers on a chaotic daily basis, as Congress and unions and suppliers and every imaginable interest group pursues every remedy available to them to get on the priority list. BPC quotes Fed Chairman Ben Bernanke as saying that going past the X Date “would no doubt have a very adverse effect very quickly on the recovery. I’m quite certain of that.” Not to mention the stock market, and the country’s credit rating. Also, are the Treasury’s information and processing systems sophisticated enough to thread all these needles day after day? In the face of all of this, I’m persuaded that I was far too dismissive of the potential effect of hitting the debt ceiling in 2011. So why would House Republicans risk all that by refusing to raise the debt ceiling? Because they believe they have no better option. America is on an unsustainable financial path. When a financial system is unsustainable, eventually it blows up in costly and chaotic ways. Recall the bubble that burst in September 2008, when Lehman went bankrupt and Merrill Lynch sold itself over a weekend to Bank of America. The longer the day of reckoning is postponed, the worse the carnage will be. The 60-plus Representatives who self-identify as members of the Tea Part Caucus believe, correctly I think, that their constituents have sent them to Congress to reverse the growth of spending and taxation now, rather than let our children and grandchildren deal with a bigger mess later. Don’t be taken in by arguments that the debt ceiling has nothing to do with future spending, only with past spending. Capping the debt ceiling is analogous to when a credit card issuer refuses to make any further increases in a family’s credit limit. Whatever already has been paid is water under the bridge. The family will have to prioritize what it pays going forward. The difference with the debt ceiling, of course, is that the family’s financial fate will have very little impact on the overall economy. Republicans were dealt a losing hand last month in the misnamed fiscal cliff crisis, where holding the line would have meant income tax increases for nearly all working Americans. Digging in here is more easily defensible as a refusal to let the country go deeper into debt. Yes it will hurt the economy, which is fragile just now. But there will never be a convenient time to begin the necessary, wrenching, fundamental changes in the way America conducts its business. For their part, Republicans finally appear reasonably united around something practical and reasonable—the “Boehner Rule,” named after its author. It requires matching any debt increase dollar for dollar with spending cuts. Here, the GOP will likely find wide public support. It’s going to be an interesting few weeks.